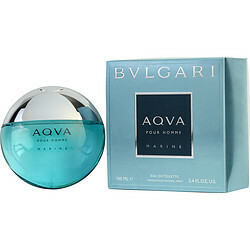 Prior to purchasing Aqua Marine, I was an avid fan of Bvlgari's Aqua Amara. Being that this is another Aqua flanker I figured it would be similar. Glad I bought it! Refreshing, light, aquatic that lasts! Now I just need to get the original Aqua Por Homme! Great blind buy if you love aquatics. I've always had a difficult time finding a cologne I like. Usually, I just finding them too overpowering or they give me a headache (especially sweet ones like Fahrenheit). I recently discovered aquatic fragrances but still struggled to find one that didn't turn my stomach. Then I found Bvlgari Aqva Marine. I love this scent! A very fresh scent and a little briny, which I like. My only complaint is the short longevity; it seems like it's gone before it even gets going but maybe that's just on me. I recently tried Aqva Amara and, somehow, it's even fresher smelling than Marine and it lasts FOREVER (at least twelve hours)! I like the scent; it's citrusy with some sweetness, has the sea salt that I love (though barely detectable to my nose), but it definitely doesn't have the same intoxicating, darker scent that Aqva has. If you like sweet, fruity aquatics, try it. If you like more citrusy aquatics with a hint of sea salt or want an authentic beachy scent, go with Aqva. My husband has this fragrance and he just likes it....I LOVE IT! For Father's day, I gave my dad the gift of Bvlgari Aqua Marine and he LOVES it! I love the subtleness of it. What was nice was that I did not realize I got a huge disk for the same price as my husband's smaller one. Fast delivery. Easy order process.